The “Gran” Daddy of Abruzzo! 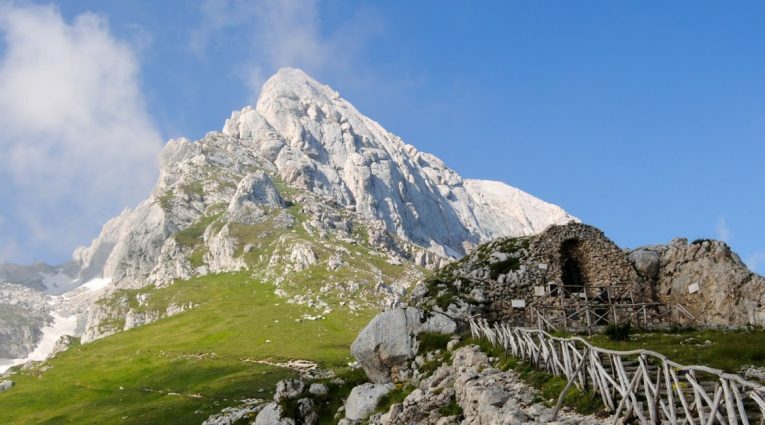 The Gran Sasso, the mountain with the tallest peak in all of the Apennines located west of Pescara on Abruzzo’s northwestern border with Marche and Lazio. The mountain has a storied history from housing the prison where Mussolini was held before the Nazi’s raided it by soldiers flying in on gliders in the middle of the night to more recently being the home of a laboratory which studies cosmic rays and dark matter. It has also been used as a filming location for several big budget movies such as: The name of the rose, Red Sonja, Ladyhawke and King David. Gran Sasso is the centerpiece of the Gran Sasso e Monti della Laga National Park, one of 3 major national parks in Abruzzo which has more park land than any other region in all of Europe. For outdoor sports enthusiasts, Gran Sasso and the surrounding area is a dreamland, however (and much to their surprise and pleasure), while frequented by skiers in winter and mountain climbers and hikers in other seasons, the Gran Sasso is remarkably free of tourists despite its close proximity to Rome and the events of the Gran Sasso raid for Mussolini in 1943. This is especially true in summer with most Italians preferring beach vacations and foreign visitors more likely to visit the mountains of northern Italy. Gran Sasso d’Italia! The biggest and tallest mountain outside of the Alps! It is both majestic and welcoming, both beautiful and terrifying, it is THE ROCK of Abruzzo.